Welcome to the voting page. To deter cheating, your IP and voting time will be logged. Click the button below to finalize your vote. If you do not wish to vote at this time, click here to visit Zed Wars stats. No one knows what happened first but suddenly the world was completely different... Society was gone, the government was gone, everything was gone. This is when you find yourself fighting for your life against creatures that rule the mainland. While searching in desperate need for a place to hide, you come across an old book... A child's attempt at a cry for help. Inside you find a map... it shows the path to safety. It shows the path to an island. As you begin your journey you find other survivors. As you talk to them you find that they are just as bewildered as yourself. So together, you all set out... Heading for the only stitch of hope that you could find the island that was said to be safe… Untouched by the creatures known to be zombies... After an immeasurable time at sea you found yourselves starving... dying of thirst ... 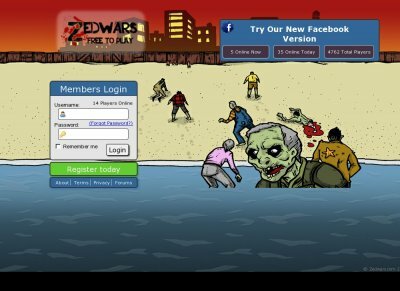 When night came and with it sleep, the morning sun brought something unexpected The boat was gone a wreck on the shore and you now lying in the sand half dead yet, you could see it A sign.... As you drag yourself closer you could just about make out that it says... Zedwars! Welcome to Zedwars Here you can be safe to live in the city of ZedWars. You can battle other players, join and build gangs, search the sea for food,riches and rare treasures such as pearls. You can search abandon houses for cash, race boats, and much much more... You have found the lost island of ZedWars, welcome abord.